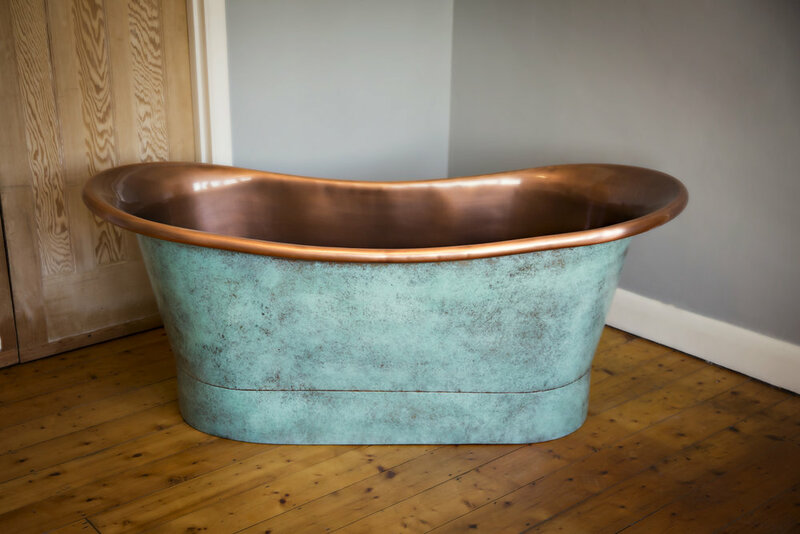 The Trent Copper Bateau comes with a slightly different finish to our other baths. The outer vintage verdi gris exterior gives the bath a marbling effect and comes in a beautiful duck egg blue. It works extremely well with the brushed copper interior and lends the usual industrial feel but with a dramatic, more glamorous feel thanks to the verdi gris exterior. The exterior may be different, but the methods used to make it will be the same as our other baths using high gauge copper, hand beaten, polished and sealed. It’s a unique hand finished look that gives your bath that unique one-off feel. As with our other baths the Trent Copper Bateau will come in the usual standard size which is (l)1700mm x (w) 705mm x (h) 710. If you need a bath in a different size, we can create one specifically to your requirements, taking around 8 weeks to manufacture and deliver. Just ask us about this bespoke service and we’ll be happy to help.